Bhutan seizes banned vegetables from India in Thimphu. 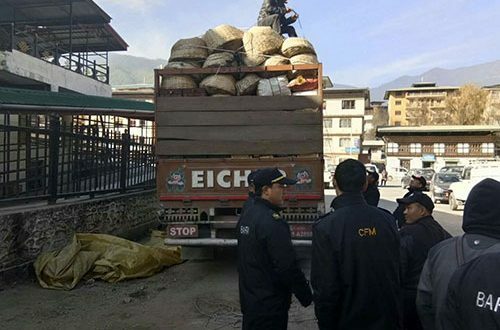 Bhutan Agriculture and Food Regulatory Authority (BAFRA) officials seized about 2,925 kilograms of banned vegetables in Thimphu in the morning of December 23, Bhutan’s national newspaper Kuensel reports. According to the report, the officials seized 1,400 kg of banned green chilies, 875 kg of cauliflowers and 650 kg of beans at the Centenary Farmers’ Market after receiving the information through the toll free number on December 22. Green chilies were banned in the country since July last year due to existence of harmful pesticide in the vegetable. In May last year, cauliflowers and beans were banned due to high pesticide residues in the vegetables. Following a tip-off on December 22, the officials followed the vehicle carrying the vegetables from Chuzom and were directed to Centenary Farmers’ Market for inspection. BAFRA’s officer in-charge, Kaling Dorji, said that the seized vegetables were imported from Falakata through Phuntsholing. The seized vegetables were dumped at Memelakha dumping site on the same day. Meanwhile, BAFRA is assessing the value of the seized products. Usage of pesticide residues beyond the Codex Alimentarius Commission’s limits was found in Indian agro products exported to Bhutan. In the month of July, 2016 Bhutanese government imposed the ban due to high chemical content.